I'm not writing a book (yet!) but I do write technical articles on a regular basis. The previous brainstorming phase is brilliantly solved with tinderbox, but what would you recommend for writing a longer copy, once you have all the ideas sorted out? What do you guys use? Ulysses, Scrivener, something else? Ideally it should support markdown and exporting to wordpress and medium. how about " BoXPress 1.5.6 " ? BoXPress is a derivative form Tinderbox. Page1 > Tutorial for exporting full website.
" BoxPress is a fun and intuitive export system for your Tinderbox notes. " I use this brotherly tool since ver.1.5. Especially pertaining to export as HTML. about my Flute Master Marcel Moyse with BoXPress. I only hope you find it worthy of endorsement. I talk about something else. sometime Ulysses as you offer. Aside from this Mellel or NisusWriterPro. In addition to previous post. I would like to suggest Ulysses 2.6. You can export ( publish ) to WordPress that I have just posted day before yesterday. In addition to this, how about Zettelkasten ? You can export markdown, XML, HTML, .txt , tex , CSV etc.. It is really too bad, Zettelkasten WiKi is under construction even auf Deutsch. I believe it would be useful, too. WAKAMATSU, wow, I have been using, and digging around TB for over 2 years now: I never heard of PressBox. I am surprised. - Do you want to finish your articles using Latex? By "technical", are you thinking of scientific publications, or web publications (blogs and like that)? if yes, then, Ulysses and Scrivener is too much a process and hassle. You should be able to directly take your notes to your Latex editor ( I use Texstudio). For exporting to Latex, you can either use the html templates, or, rtf conversion. I find the latter more efficient because the html tags are not sufficient to mark all the formatting. I found a good tool (http://rtf2latex2e.sourceforge.net)to convert rtf files to latex: I automat the process with Hazel. I am good to go. If you want to publish with Word ultimately, both the tools you mentioned does great job. Personally, I find Ulysses more elegant and attractive; and the exporting process is unbelievably simple and elegant. Exporting from Scrivener is a bit clumsy process. Both of these tools accept opml--the process should straightforward. If doing LaTeX, this might be useful: Working with LaTeX. This is not to suggest Tinderbox specifically aims to use LaTeX as an export format, but the linked-to article came from discussion here some years back from someone who wanted to export direct to LaTeX. Thank you for your advance a suggestion and asking a question of LaTeX. I have considerable interest in yourscript with Hazel. It will make better use of my Hazel 4.0.5, seem worth a try. In respect that here is a restricted area to make a trade of personal use. Tinderbox is my final frontier. from LaTeX to HTM for the good reason that I bought it. Until Ulysses II persisted these translation. By the same token why I found Emacs with LaTeX usable. I am not thinking of scientific publications. I am a person doing research on Japanese classics（notably ancient writing " Kojiki " ）. Kojiki (published ca BS.712) is parallel instance or analogous to Edda for your country. that was disputed aspects of Kojiki. I would like to make a review of Kojiki-denn with LaTeX. Once I try to write-down using NoteTaker.app. , came to grief. and to use the language of the day. LaTeX is relatively easy way. I have a long waite for consummating SILE. With SILE, I can put down with 3 different Japanese style. I am afraid that SILE can not allow export as HTML (PDF export is allowed). Using LaTeX with Emacs is accustomed for me. I finish my document without thinking how to regularize. LaTeX is my old self. I am a proffesional Classic Concert Flutist. It is quit easy to follow along reading from the musical score and LaTeX writing. We can find many special significance for create expressions. LaTeX might as well say the same to musical notation. Music is a symbolize with interpretive semantics. According to my predilection, I transform LaTeX from HTML into another html Format. My favorite converter is HeVeA, correctly LaTeX to HTML translator, and it's flexibility. I made trial of LaTeX to HTML/XHTML/Epub almost evry converter. use Pandoc as a convertor. Tinderbox is open to interpretation and fine-tuning( für mich selbst). I do not think to write nor to publish with Word processor what one does not like. Thank you Mark: I have template based on your http://www.acrobatfaq.com/atbref6/index/Export/WorkingwithLaTex.html : It works fine except some formatting that the HTML tags don't support. For the Latex friends: if you are ready to go to the rabbit holes that I went through, I now have a little magic script which turns the texts in TB to Latex format by simply copying it. Copy the RTF (TB) note-->hit a key--> you have a clipboard formatted in Latex, voila! Paste it in your editor of choice (Emacs for WAKAMATSU). Once the first two are installed, the system also works in Hazel. By the way -- for those interested in longer text -- I wrote the whole first draft of Decline and Fall in Tinderbox, and the second draft in a combination of Tinderbox and Storyspace. That’s 97,000 words in the text, and perhaps another 25 or 30,000 left on the floor. Tinderbox itself can be a nice environment for a big text. Thanky for your useful information. I did not recognize about Mark's template for LaTeX. 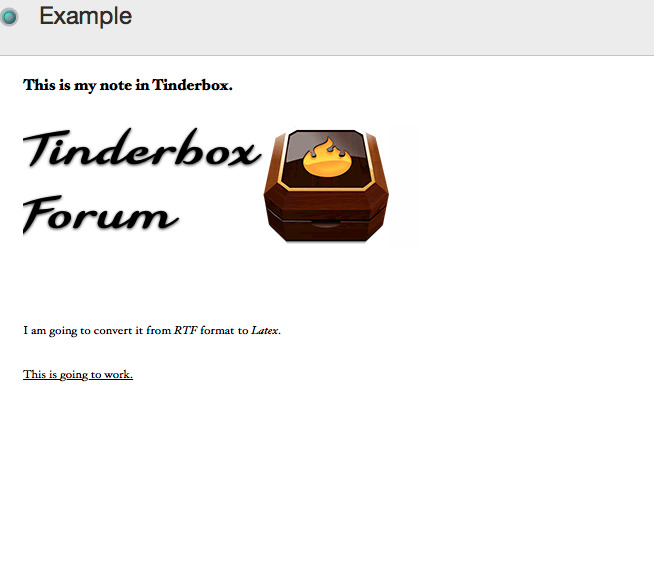 I am quite Tinderbox newbie. [ 1 ] I get rtf2latex2e via brew install. I have installed in My OSX10.11.6 El Capitan [pip install unoconv] , [unoconv-0.6] is sat it up. I try to download LibreOffice 4.3.7.2, this old dmg file take much time to DL, so I will install ver.4.3.5002. ●　I have got rtf2latex2e and unoconv . Thanks. Please lead the way in !! Could not I use [LibreOffice_5.2.0_MacOS_x86-64.dmg]? First, you have to play a little bit how rtf2latex2e works. It is really cool tool. Try to understand how it works because it gives you a full control how to convert RTF to latex. Once you make sure that it is working on your machine: use this KM macro to copy the RTF notes into Latex. Now, try it. If rtf2latex2e is working, the KM macro should work. Just open a note in TB, select the part you wan to convert: and, hit the key (CTRL+ALT+CMD+C is what I made; u can change it). now, your clipboard should contain a Latex document to be pasted in your editor. I made a folder for rtf2latex2e exactly same as [rtf2latex2e]. should I chamge to case sensitive ? because terminal indicated [Processing /Users/WAKAMATSU/Documents/RTF2Latex/temp.rtf]like that. Using CotEditor , I can transform rtf to latex, but with Tinderbox note I can not act in similar fashion. It must be beginner's screw-up. But what and whre can I cheque ? When my note have some kind of image? But I do not know how to insert for this Forum,yet. Here should I change there as a username? I'm sorry to ask a rude question, I made an easy-mistake. I should tell RTFD to LaTeX. This Convertor is rtf to LaTeX. This is a common mistake made by beginners like me. I find mention in  following. rtf2latex could not work the other way like LaTeX2RTF ?? There is now rudimentary support for \includegraphics. Three file types will be inserted into the RTF file without needing conversion: .pict, .jpeg, and .png files. EPS and PDF files are converted to PNG using convert from the ImageMagick package. Some options are even handled properly. I didn't actually investigated the image insertion (conversation) capabilities of the script since I rarely insert images into my TB texts. That is interesting actually. I will look into it in the future, if the need arises. I don't think the reverse direction is possible. I never thought about it before as I always finish my writings with the Latex. That will be interesting too. Pandoc should be able to do that. I wonder if rtf2latex2e could export with images. I know using Pandoc can export from LaTeX to rtf but maybe not to rtfd ?? Might I ask you some questions? You insert images into your TB text. In individual note itself or somewhere else? For small snippets, shorter images, you can direct drag it into the text area; copy paste. Screenshots fit very well.